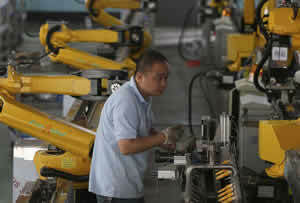 Bien Perez for South China Morning Post: � Annual spending on robotics in mainland China is forecast to continue its rapid expansion and exceed US$59 billion by 2020, as demand ramps up in the countrys manufacturing industry. The mainland will remain the single largest and fastest-growing robotics market in the world, accounting for more than 30 per cent of global spending during that period, according to a report released Tuesday by technology research firm IDC. “China continues to lead the growth of worldwide robotics adoption, primarily driven by strong spending growth in process manufacturing and cross-industry applications,” said Zhang Jing Bing, IDCs research director for worldwide robotics and Asia-Pacific manufacturing.